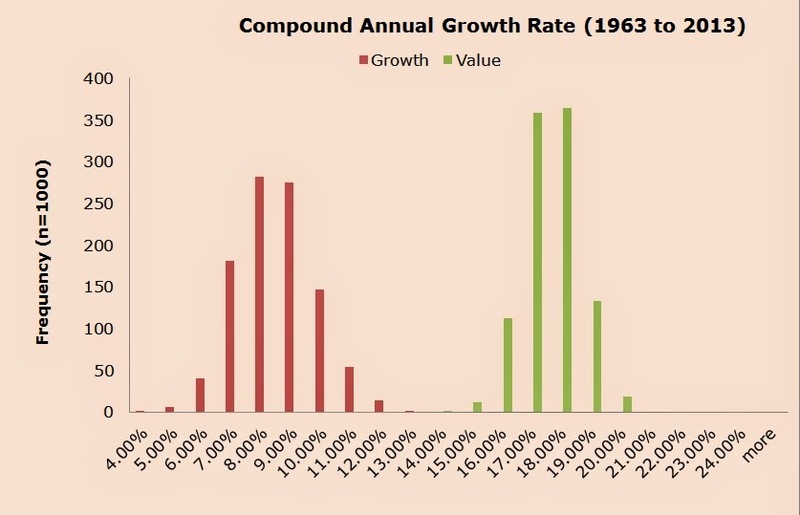 Here's a recent article testing growth ("expensive") stocks and value ("cheap") stocks. The test finds that, very consistently, value has higher returns and lower volatility risk than growth. The U.S. stock market is currently on the expensive side, and stock markets outside the U.S., especially emerging markets, are on the cheap side. There is a lot of academic evidence suggesting that value stocks should be offered as a benchmark to follow. The evidence is so strong that most academic studies actually use value as a control. One of the problems with cap-weighting (for example, the S&P 500 index is cap-weighted) is that cap-weighting gives more weight to stocks that have gone up in price and gotten more expensive. This is probably the reason that cap-weighting underperforms almost every other method of indexing - even an indexing method that picks stocks randomly. Click through to read the entire article: Never Buy Expensive Stocks. Period. One can't even simulate a scenario where a diversified portfolio of 30 expensive stocks can beat the worst performing portfolio of 30 cheap stocks. Why investors allocate to expensive, or "growth," stocks is beyond me.